Succinctly put, food forests are “perennial polycultures of multi-purpose plants powered by the sun.” Following the patterns and ecological functioning of established forests, we are attempting to create stable, resilient, and diverse systems that require few outside inputs and are highly productive in relation to the amount of labour required. These gardens are not intended as a replacement of a natural forest; rather they are analog forest systems that can provide a wide range of yields to people while at the same time offering numerous ecosystem services such as carbon sequestration, habitat, soil building, microclimate creation and water retention. 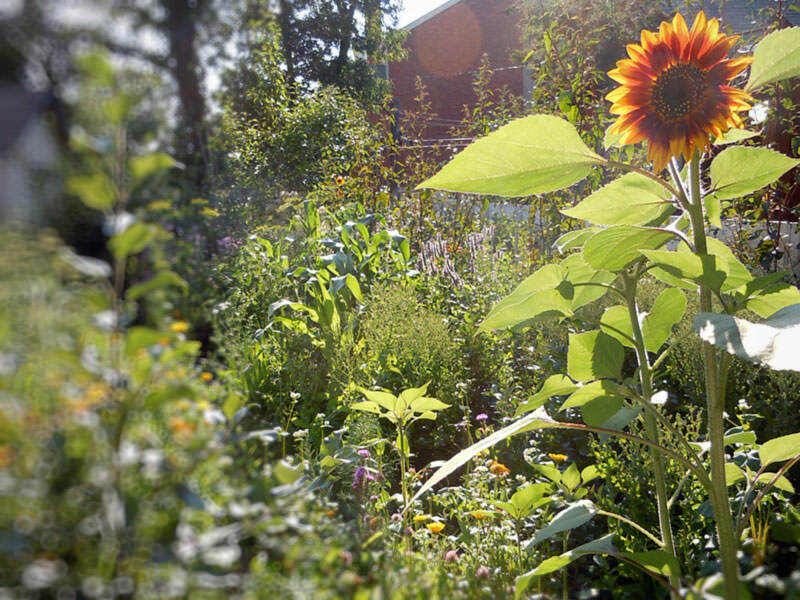 Two year old edible forest garden in Edmonton. Edible forest gardens typically include a diverse inter-planting of edible perennial species such as fruits, berries, nuts, perennial and self-seeding annual vegetables and herbs, mushrooms, and, if desired, small livestock such as bees, poultry and other animals. But forest gardens can also include many other yields such as medicinal plants, coppicing plants like willow or dogwood, plants for a wide range of crafting activities, flower production, harvestable timber species, perennial plants for bio-fuel production, and beautiful spaces for relaxation, recreation, learning and retreat. From a small urban yard, to a community space, to a large acreage or farm, food forests can be designed for any scale and context. While many food forests are intended for the self-sufficiency and pleasure for those who live among them, others are also designed to create a surplus of yields that can generate income and livelihood. Common to all forest gardens, however, is the careful design that locates all species in positive relationship to each other, thus establishing a living ecological system that will become largely self-sustaining and regenerating long into the future. of your own Edible Forest Garden. A consultation to help you assess the potential of your own particular land to support a forest garden. Providing you with a data base of appropriate plant and fungi species for a forest garden in your region. Working with you in the creation of a forest garden design for your property. Holding an Edible Forest Gardening workshop at your property which will include hands-on work towards the installation of your forest garden. Edible Forest Gardens – A perennial agriculture alternative by Ron Berezan, Canadian Organic Growers magazine.